Had a request to make a birthday card for the daughter of of co-worker. She lives out in the country and loves yellow and green...I thought...OHHHHH I have the perfect scrap of DP for that card! I started with a 5 1/2 x 8 1/2 kraft base, added borders of yellow and green and the layer of DP that has deer, moose, squirrels, skunks, foxes, buffalo and trees on it. Then I made the banner with the Fishtail / Banner die set from "Your Next Stamp." Heat embossed the sentiment and coloured it in to match the DP and voila!! Cute card ! Great job! 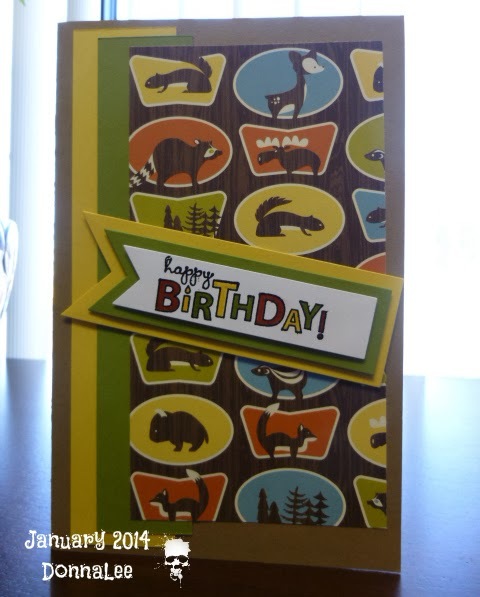 wow super cute card, love that paper. I'm sure your co-worker will be pleased.